Not sure what to get your sweetheart for Valentine's Day? 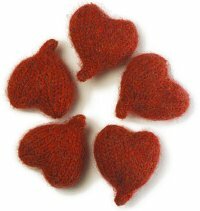 Instead of buying the same thing as last year - a red, heart-shaped box full of chocolates - make your loved one a knitted gift instead. Knitting gifts for Valentine's Day not only shows someone that you care, but it's fun and results in a unique present from where it counts - the heart. By using this free eBook, 9 Free Knitting Patterns for Valentine's Day, as your inspiration, you'll find tons of great projects to make gifts for everyone that you care about. In the 9 Free Knitting Patterns for Valentine's Day eBook, you'll find everything you need to make the big day special. Download the 9 Free Knitting Patterns for Valentine's Day eBook now! Knit and Felt Hearts, p. 5 - Not only will these Knit Felt Hearts knit up within two hours, they also make an adorable present for Valentine's Day. Make some for your entire family and send them a nice surprise on the big day. 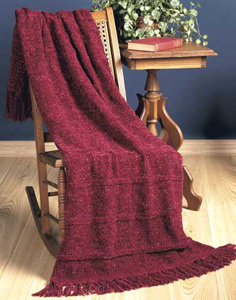 Valentine's Ruby Throw p. 8 - Wrap the person you love in this beautiful Valentine's Ruby Throw. They'll appreciate the time you took to make it, plus its perfect for Valentine's Day. Heartfelt Mini Hearts p. 12 - Use just a skein of yarn to make 15 Heartfelt Mini Hearts. 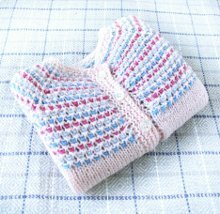 This free knitting pattern is perfect for Valentine's Day. Whether you stuff these little hearts into a giftbag or attach them to a card, they make a wonderful gift. So what are you waiting for? You'll find everything you could possibly want to make for Valentine's Day in this free eBook. These projects are easy to make and colorful, in other words, they're just what you need. So gather your yarn and needles and start making those gifts! Hello--How is it possible Besotted Scarf By: Hello Yarn Make your loved one something special for Valentine's Day by knitting them a Besotted Scarf. Textured with X and O letters, this scarf will surely get you tons of hugs and kissed once received pattern is not longe for download from the Valentine's Day eBook? There are two (2) patterns that has always defeated me--reading/ATTEMPTING aran patterns and how to use FOUR dbl ptd ndls. Are there SIMPLIFIED instructions for these? I use to knit way back then, but I don't expect this that this could be a great idea to give as valentines presents. Ebook is a great help making knit patterns and designs. And it would make my knitting so fast and easy. As we celebrate heart day, we almost spend to much from it. Read this: Studies say spending will be up for Valentines Day. As we should not take that too expensive for us to get along with our love ones. While this book looks interesting, and I would like to make some of them, it is a reipoff. I need an ebook with the patterns included so I can use it without the computer being connected to the internet if I need ity. This is not possible with this book. I am going to have to hit each link and copy the pattern to a print file. What a waste of my time! 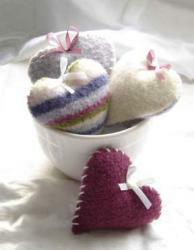 found exactly what I needed, a pattern for knit and felted hearts. I'm making them as pincushions and decorative wall hangings. Thank you so much! Not what I was looking for---Sorry! !